I’m mixed race, but I’m three generations mixed race, which means: I’m mixed race, my mother is mixed race, and her parents were both mixed race. My mother is from Singapore, an island country in Southeast Asia, and my father is from New Jersey – white as white can be. Being half Asian and half White caused a lot of internal conflict within my own psyche. I often felt I had to “choose” between one, while also feeling that choice wasn’t always up to me. Growing up, I didn’t have anyone else to model myself after because Singapore has its own specific Asian culture, and Eurasian culture is so niche within that as well. I didn’t have any sort of representation to look to in America that could help me reflect my own identity. Since I was so confused, and didn’t know how to explain my racial identity and culture, it seemed other people felt it was their place to fill in the blanks. Questions I got a lot growing up, and still get to this day, were, “Where are you from? No, where are you really from?” or sometimes just flat out, “What are you?” These questions made it clear in my head that I didn’t fit in with the white kids. Then when I would try to explain my identity, other people would even correct me. I remember so clearly being in third grade and telling this girl that I was Asian, and she said to me, “Well, you’re not a real Asian because you aren’t Chinese.” I looked ambiguous to people because most had never seen anyone who looked like me. We were all growing up in a society focused on racially categorizing in these very specific boxes and none of them really fit me, so I would get grouped into the “most common denominator,” which has often been Latina. I started to naturally gravitate to the latinx kids in my schools, often being adopted as an “honorary Latina,” but even then, I was always aware that I never truly belonged to the latinx community either. Throughout high school I tried to figure out where I sat in the liminality of my race. Firstly, I owned my identity as a brown women completely, almost to the point of rejecting my white identity. These attempts at reclamation of my own identity happened on both conscious and unconscious levels. Consciously, I gravitate towards activism and social justice having always looked up to and been inspired by Black activism of the past and present. Unconsciously, my body was naturally gravitating to a social circle of entirely brown kids who looked like me, something I wasn’t aware of until the end of my Sophomore year. 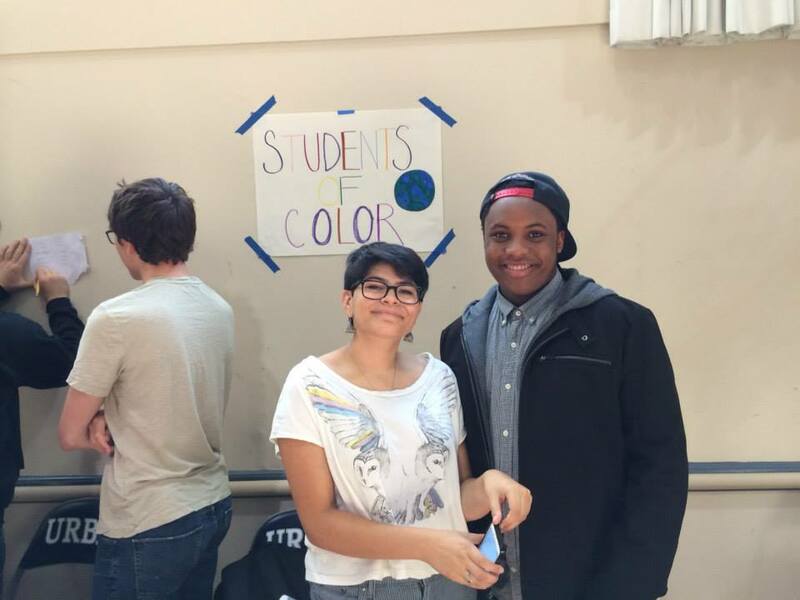 I took on co-leading the Students of Color affinity group at my predominately white, private high school. I spoke out and defended students of color at the school. I devoted my time to researching beyond what racial history and theory lessons were offered at my high school. Understanding my race was a focal point of knowing how I fit socially in my world, a problem I devoted so much time to that other intersections of my identity fell to the wayside and got left behind -- primarily: gender and sexuality. Once I felt I could own both sides of my racial identity without negating the other, being neither fully “Asian” nor “White” but some no-man’s land in between, I suddenly had room in my head space to come to terms with my queerness. Some small part of me had always known I was queer, but never had access to all the nuances that queerness could entail. It started off as accepting I was sexually attracted to women, to then understanding this did not negate my previous attraction to men, to using the term “bisexual,” to being invited to look beyond the gender binary, to never feeling that “bi” or “pan” ever quite described how I experienced sexuality and gender as the two wove strange pathways through and across each other. I left my softball team, joking that it “turned me gay,” chopped all my hair into a boy-short pixie cut, and took on a more quasi-masculine form of dressing. Everything I understood about queerness I learned from my journey with race. In both cases I had always felt like I was on the margins looking in at groups of people that always seemed to “fit.” I realized that the contradictions I felt inside of my body due to the conflicting binaries of identity categories were the ontological nature of my existence. My entire identity existed in liminalities and could be summarized by queerness. To me, identity is inherently queer. When I left high school to study Drama at NYU Tisch School of the Arts, I promised to dedicate my creative work to representation. I wrote and spoke about the importance of theatre for social justice in my college applications. I stayed true to my word and co-founded and was the Director the first Tisch Drama, studio-affiliated affinity group: Atlantic Students of Color. After I left the Atlantic Acting School, I have continued to work with the administration at Tisch, primarily Rubén Polendo, to advocate for students of color. I wanted, as Junot Díaz said, to create as many mirrors as possible so those on the margins like myself could see themselves. I never lost this spirit to my work as my mission has since developed. Both in my life and my work, I explore notions of decolonization and healing -- what it means to connect back to a past that was stripped from myself and my colonized ancestors and how to hold their memory in honor as I continue into the present. With this, I bring my entire body and being and all of its inherent contradictions. My work functions as my compass for the world. I want to leave my work behind as a gift or honoring for those who have also lived on the margins. My wish is someone can encounter my work and perhaps feel less alone or inspired to share their own niche narratives.